In a competitive context where medical device manufacturers struggle to grow their profit margins, develop new lines of business and maximize customer satisfaction, new service offerings generate new, differentiating businesses. Karvy Analytics’ proprietary Predictive Maintenance offering uses advanced Machine Learning algorithm to analyze sensor data embedded in the devices to accurately predict when, where and what type of fault is likely to occur. With this information, the Remaining Useful Life of any given device is always known; maintenance service contracts can generate additional revenues; maintenance schedules, costs and resources are optimized to the specific fleet of devices; and customer satisfaction is improved. The current trends in Healthcare are adding pressure on Healthcare device manufacturers to maintain a high degree of profitability and innovation. Healthcare executives commonly cite the US medical-device tax, new payment models from the CMS, and competition from large companies that areentering the Healthcare space as contributing to the flattening growth estimates and diminishing margins in the industry. In this context, Healthcare device manufacturers are putting more focus on service-based lines of business. Internet-of-Things (IoT): the connection of physical objects into a larger network through embedded sensors and means of communication. IoT has expanded to the medical device world to monitor devices’ status and functions. Service contracts have long been one of the most profitable lines of business for Healthcare equipment manufacturers.For example, two years ago, one of our clientsrealized that its installation and training service contracts were generating twice the profit margins than sales of the original equipment. The company decided to expand its service line by providing insights on the devices that were sold to each customer.The company’s overall profit margin is now 50% higher than it was two yearsearlier. Nevertheless, service managers are under tremendous pressure to maintain a high level of customer satisfaction at lower costs. In this context, medical device organizations are always seeking new ways to differentiate their service business and the Internet-of-Things offers them thatvery opportunity. By embedding sensors and communication means onto medical devices, manufacturers monitor the status of the equipment under a service contract to improve the efficiency of support operations, increase their service contract profit margins, and improve their customer satisfaction by reducing potential equipment downtime. The sensors may record anything from operating settings, environmental conditions, adverse events, or faults. Nevertheless, the selection of meaningful data and analysis of such a huge stream of information remain difficult and costly for many service organizations. For organizations that arenot presently leveraging IoT, proper planning is essential for stimulating the appetite for change and innovation that will allow introduction of IoT within the organization. The very first step is for upper management to drive a clear top-down IoT agenda, with an assertive vision for the company, and to enable a task force to lead the transformation throughout the organization. That task force must then build the right capabilities within the teams, by hiring the appropriate talents in the IoT space, and establishing a solid network of providers and by investing the right dollar amount in the right tools. The next step consists of targeting specific business processes that will benefit from the first applications. Section 4 below details specific examples for Maintenance Services. Besides identifying relevant business opportunities, the task force must set the right target KPIs against which to measure success, and develop acceptability with managers. Last, but not the least, initial IoT successes need to be institutionalizedand turned into a continuous innovation process. Big Data endeavors in general, and IoT endeavors in particular, represent a unique opportunity to develop and boost an innovation culture. Particularly in the field of service for Healthcare providers, only continuous innovation with the proper level of engagement from key customers can enablean organization to stay ahead of the competition. Figure 1- How to introduce an IoT Strategy and tailor Karvy's solution to the specific Service organization. It is estimated that 50billion individual devices be connected by 2020, including consumer, industrial and healthcare applications. Not surprisingly, a recent McKinsey study estimates the IoT market would grow to anywhere between $4 and $11 trillion by 2025. 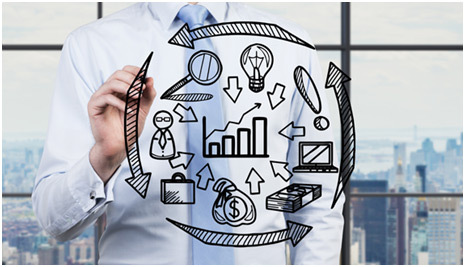 That market includes not only the new generation of connected devices and sensors, but also the analytics tools and business process improvement. These tools are now available to medical device service organization to differentiate themselves in multiple ways. Once a Healthcare device manufacturer explicitly sells services as a separate line item, the question for managers becomes how to grow the profit margin without sacrificing on customer expectations. Our Predictive Maintenance offering allows manufacturers to reduce the number of field-service calls and increase first-time-fix rates with remote access, diagnosis and repair. Furthermore, predictive analytics enables new service pricing models around a pay-per-call business model that would otherwise be too onerous for customers. Last, an early alert system at the time of fault avoids warranty claims that come from failures within the normal range of manufacturer-recommended maintenance schedule. In 2014 alone, Healthcare manufacturers paid over $1 billion in warranty claims. Although it is unlikely to reduce that number to zero, IoT has demonstrated its potential in validating existing warranty claims and reducing further claims for the same devices. 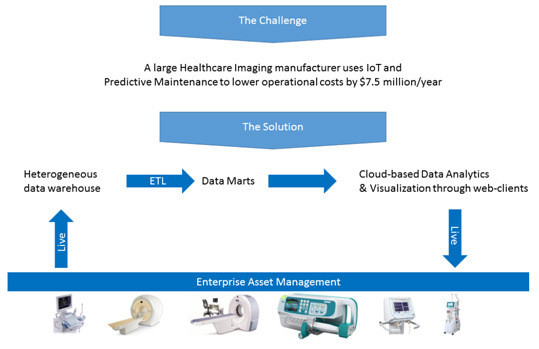 Figure 2- Case-in-Point: a large Healthcare Imaging Manufacturer uses IoT Predictive Maintenance and saves $7.5 million/year. As service managers have sufficient knowledge to develop a maintenance schedule, is a balancing act between cost, customer satisfaction, and resource management. Predictive Maintenance takes the guessing game out of the equation and provides reliable insights over resource utilization and cost. With a predictive health indicator for each system, the maintenance events may be scheduled in such a way as to avoid resource crunches, and maintenance events may skip connected parts. In addition, Healthcare providers tend to over-stock replacement parts to avoid shortage. As an added benefit, service providers using predictive analytics can help customers manage their stock. For patients as well as caregivers, IoT Medical Devices make it possible to have a richer and more intimate engagement with each other. Automation of data collection makes it possible to collect data accurately, on time and with minimal human intervention. All stakeholders receive better visibility with respect to the patient's condition, progress and outcomes of treatment. Automation of engagement also allows better compliance to prescribed treatment regimes. In the context of service, a service provider connected to the devices will extract insights over the devices statuses, operations and behavior. These insights unlock a tremendous potential in terms of customer satisfaction. One of them is to give an early alert even before a fault occurs, and to provide a more flexible maintenance schedule to minimize downtime and interruption in the Healthcare practice. That added benefit not only comes with improved customer satisfaction, but also higher returns for the Healthcare practice that does not suffer an emergency interruption. With predictable Remaining Useful Lives over their fleet, Healthcare executives reduce the level of financial risk in calculating the Total Cost of Ownership, manage their supply chain and stock of parts more accurately, and actively participate in selecting the best service contract together with the manufacturer. With over 30 years of experience in data management and insights, Karvy Analytics operates from New York City, and Hyderabad India. Our Predictive Maintenance model for Healthcare, the MedTech Prognostic IoT, identifies a proprietary Health Indicator based on sensor information embedded in connected devices. With over 90% sensitivity, our model is able to predict correctly faults 30 to 20 days in advance. In over 99% of cases, system failures could be avoided as per our past results. Using sensor data that is already available on the devices, the model is tailored to each specific device automatically, and results are presented in the form of a convenient dashboard. Service managers and customers may access that dashboard from the internet anywhere, anytime. The dashboard can also be integrated in a larger service enterprise platform if it already exists. MedTech Prognostic IoT is drastically changing the face of healthcare monitoring and treatment outcomes. By providing personalized and optimized services, it promotes a better standard of living and predictable business outcomes. Just like our client who, in the span of two years, has increased profit margins by 50% by providing meaningful services out of the data generated by its machines, your own organization too can benefit from our Predictive Maintenance solution, and increase its margins, reduce costs and improve customer satisfaction. Karvy’s solution is readily available and can be either deployed in the form of a web-client, which can be tailored to suit the needs of your customers and field service managers, or further integrated in an enterprise service platform. For further information, contact us on our website at http://www.karvyanalytics.com or by email at contactus@karvy-analytics.com.